I was introduced to this project while visiting COBE's office with my visit to Copenhagen through the Scan|Design Gehl Masters Studio in 2015. 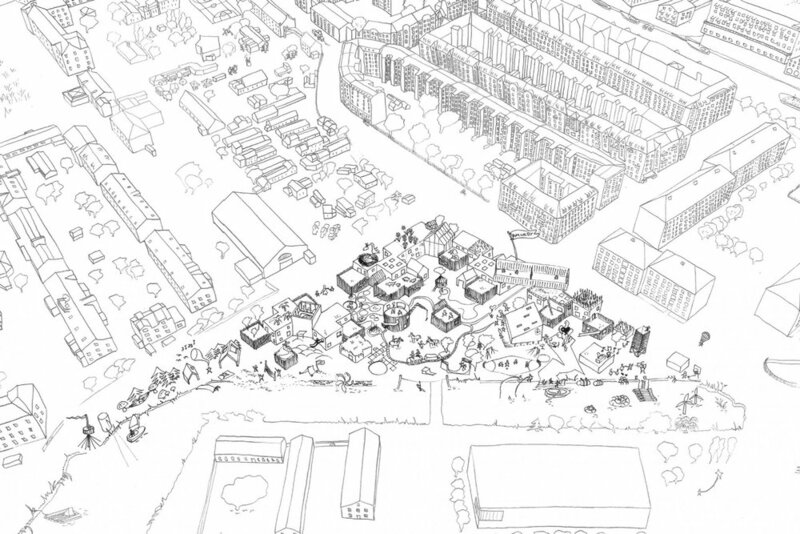 Kids' City Christianshavn was presented in a playful fashion with hand sketches done in illustrator used to describe the contextual relationship this project will have to the neighboring Christiania. Freetown Christiania is a wildly inventive place given that is a self-proclaimed autonomous district in the city of Copenhagen. Christiania is a commune, self-governing and largely self-reliant. The built context of Christiania is an assortment of haphazardly constructed buildings, many of which are residences, scattered throughout the area. The size and scale remain small in contrast to the reclaimed military buildings. This project draws from the understanding of Christiania and translates it to a child's perspective, making this school a city for the kids. A collection of small buildings haphazardly placed to enclose an urban space. Kids' City Christianshavn has a number of accessory buildings that house classrooms, offices, and other amenities. But these buildings are centered around more prominent civic buildings such as the mess hall, a stadium, and even a kids' city hall. Shown in the picture above is the entry to Kids' City. Spanning across is an enclosed sports field where the kids can play and safely observe traffic below as they recreate. As I was taking photos and observing the space, an older woman pulled up to me to explain how this was a neighborhood kindergarten. She went on to say how much she liked this building because she got to see the children at play up above the street and hear them yell and laugh. What struck me most was how genuinely excited this elderly woman was about what is clearly a modern architectural project. She could care less about the aesthetics, but she understood what it represented for the kids and the neighborhood.